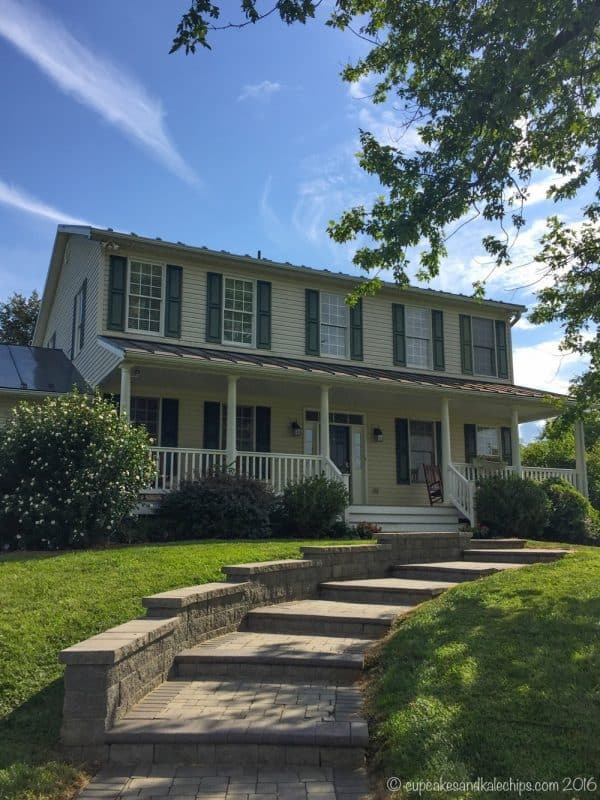 Girls’ weekend, couples getaway, or for some family fun, head only 90 minutes from Washington, DC and Baltimore to the confluence of the Potomac River and the Shenandoah River, near the borders of Maryland, Virginia, and West Virginia. 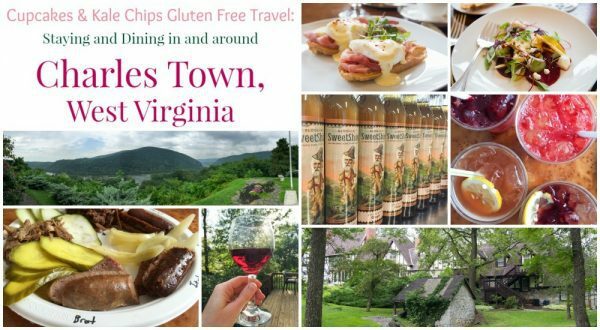 And if you have celiac disease or a gluten allergy like I do, I also have some extra suggestions and tips for you when you travel to the Harper’s Ferry area in this edition of Cupcakes & Kale Chips Gluten Free Travel: Charles Town, West Virginia. Disclaimer: Accommodations and meals were provided by the establishments mentioned in this post. The discussion on gluten free dining is based solely on my experience. If you have celiac disease or a very severe allergy, please speak with the servers and/or managers at these establishments to ensure your safety due to their practices to prevent cross-contamination. I am not a professional and none of this is intended as medical advice. Have a fun and delicious trip, and, as always, all opinions are my own. 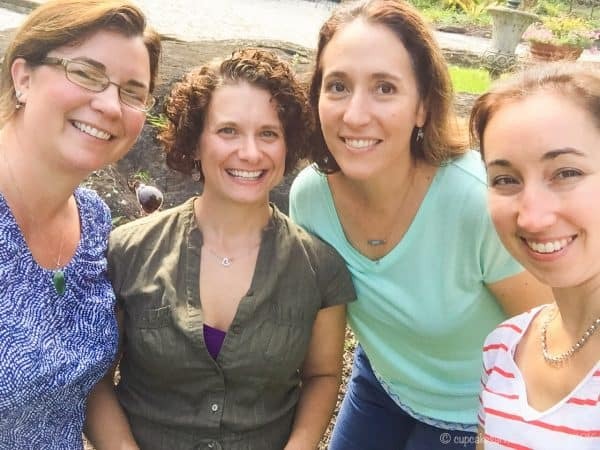 If you followed along on Instagram or Snapchat, you know that on a (mostly) gorgeous weekend in early August, I met up with a few of my blogger friends Carrie from Frugal Foodie Mama, Karyn from Pint Sized Baker, and Erin from Delightful E Made at the Hillbrook Inn and Spa in Charles Town, WV for food, drinks, “shop talk”, lots of laughs, and of course plenty of “don’t eat or drink that until we take pictures of it” for the Sip Dine Shine 2016 Retreat. We stayed at the incredible Hillbrook Inn and Spa, a lovely bed and breakfast on the land George Washington first purchased in 1750. While the Inn is historic, they have al the modern amenities, like air conditioning, and, especially important when hosting a bloggers’ retreat, wi-fi. The Main House has rooms to stay in, and is also where you’ll dine for breakfast, which is offered to all guests twice daily and includes two courses, as well as dinner if you decide to dine on the property. They typically have a sweet course and a savory course. On Friday morning we started with a lovely and light fruit soup, followed by Eggs Benedict with prosciutto. While my friends had theirs on a traditional English muffin, mine was served on toasted gluten free baguette, which I’ll talk more about later, and was quite perfect. Saturday’s meal started with the savory course or deviled eggs and bacon, followed by peanut butter-stuffed French toast topped with caramelized bananas. While I was a little jealous of the others’ croissants, even on gluten free bread, this dish was everything you could want out of an indulgent weekend morning meal. 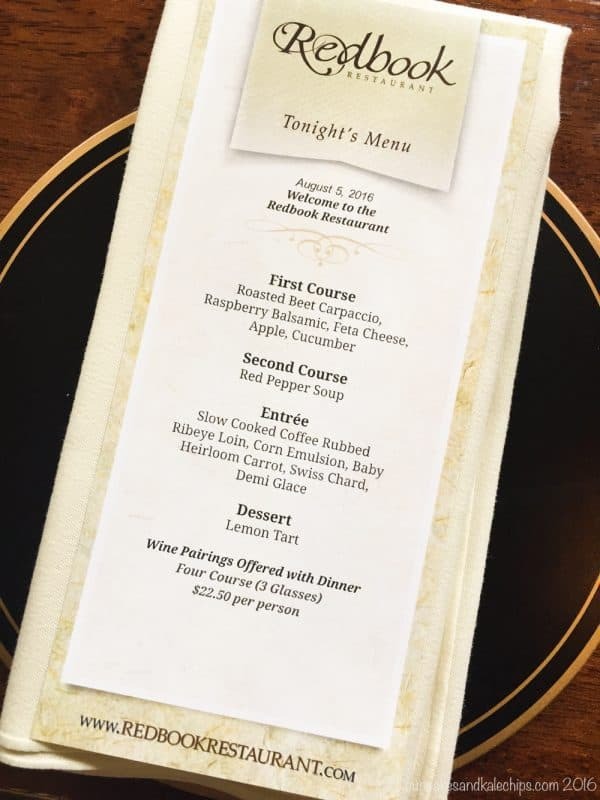 On Friday evening we headed over to the Main House for the four course dinner at Redbook Restaurant. Upon looking at the menu, I knew we were in for an experience, and Chef Justin and his team truly did not disappoint. I’ll tell you more about the meal in a minute, but let me first give you a little background on the restaurant. The name of the restaurant comes from the fact that every guest and every meal served is recorded in their red books, taking note of any special dietary requirements or requests, thus ensuring that no guest ever has the same meal twice. Chef Justin focuses on fresh and local, simple with a modern twist. That means that his menu is easily customizable to any dietary needs. 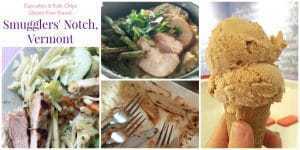 He rarely uses flour to thicken sauces and soups, and as you can see by the menu on the night we dined there, he does tend to focus on foods that are naturally gluten free. The same care is taken whether you are looking for vegan options, have a dairy or nut allergy, or anything else. Upon being seated, rolls were brought to the table, and I was given gluten free baguette. Not being the biggest fan of most gluten free breads, I usually just skip it to save the space in my stomach for something more delicious. But this baguette was exceptional. It is also what made the base of the Eggs Benedict I mentioned earlier. We started our meal with the beets, thinly sliced to resemble a beef carpaccio, topped with a composed salad of apple, cucumber, microgreens, and feta for a delicate mix of sweet, salty, and fresh, with just the right amount of crunch. This was followed by the most smooth and silky Roasted Red Pepper Soup. The ribeye loin which was the centerpiece of the main course was cooked to perfection and had just the right amount of flavor from the rub to let the beef shine and be enhanced, not overwhelmed. The corn emulsion had just a bit of spice, with the earthy Swiss chard balancing out the richness of the dish. Though the Lemon Tart looked amazing and was based on a childhood favorite of Chef Justin, my gluten free Lemon Souffle was a showstopper, especially when doused with a sweet and tart raspberry sauce. We left the meal full and happy, and I will say that if you stay at the Hillbrook or in the surrounding area on a weekend, you need to make sure you do not miss this experience. However, before indulging in that incredible meal, we indulged in some moonshine, or should I say SweetShine? At the Bloomery SweetShine Distillery, they are making hand-crafted, home-grown fruit cordials. For flavors from the original Limoncello and the playful Peach to the zippy Ginger and more, the team at the Bloomery is growing or sourcing the fruit, breaking it down and making infused simple syrups, then hand-blending it with 190-proof corn alcohol. Yes, that’s right, moonshine which is made form corn, so it’s naturally gluten free! And it tastes incredible. The passion for what they do here at Bloomery shines through as strong and pure as their fresh and natural flavors. 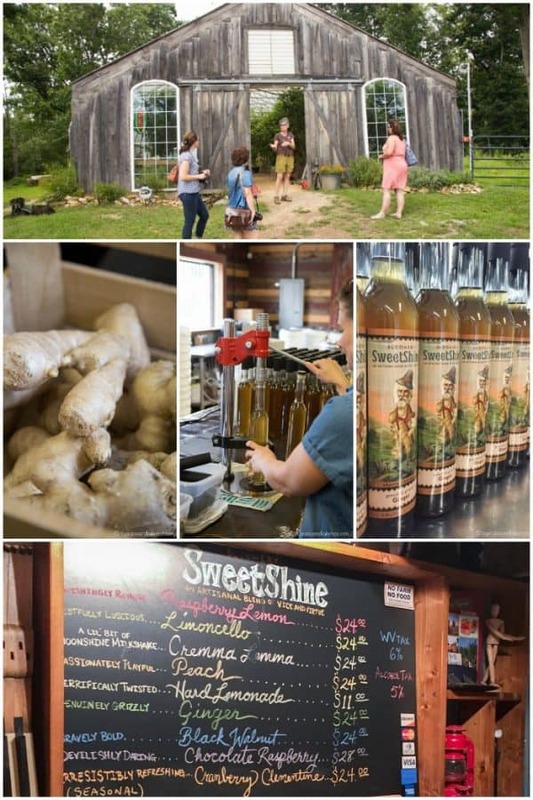 They host free tastings of all, yes each and every one of their cordials every half hour on the weekends, as well as offering live music and plenty of space to sit outside and enjoy any snacks you may have packed. Come early and be prepared to stay for the 45 minute-1 hour tasting. Between the stories, the jokes, the history, and the booze, you won’t want to leave early. If you had a blast at Bloomery, on your way out of Charles Town, stop at Guide House Grill in Knoxville, MD. Sarah, resident Mixologist at Bloomery, and her husband Darin recently opened this seasonally-inspired, scratch-made, modern barbecue joint. 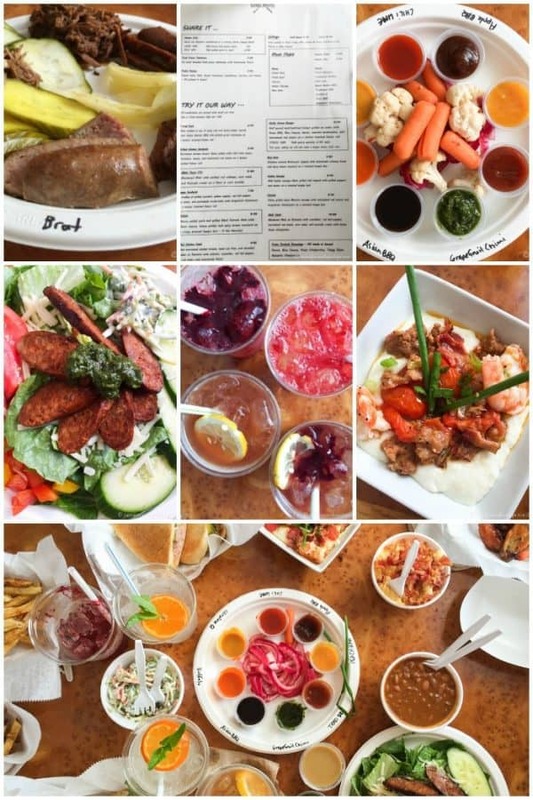 Much like Redbook, Guide House focuses on high quality, all-natural ingredients. Though you won’t find any SweetShine cocktails just yet, they are hoping to have their liquor license soon, and for now you can enjoy complimentary “mojito” infused water, as fresh squeezed lemonade and freshly brewed iced tea that can be jazzed up with fruit purees. Their focus is barbecue, so eating gluten free here is no problem at all. The pulled pork and beef and sausages are all available as platters or on salads, and they will customize with and toppings or sauces as you wish (just avoid the Asian BBQ Sauce). Of course they’ll pile it all on a bun or grill up a burger for the gluten-eating folks, and their Cuban is supposed to be amazing. Like any good barbecue restaurant, they have the full gamut of sides, and the Superfood Slaw was the standout to me! They are looking to rotate the menu seasonally, and we got to preview their Goat Cheese Stuffed Mushrooms and Shrimp and Grits. I’m not often a seafood gal, but their twist on that classic Southern dish may be the one that brings me back soon. 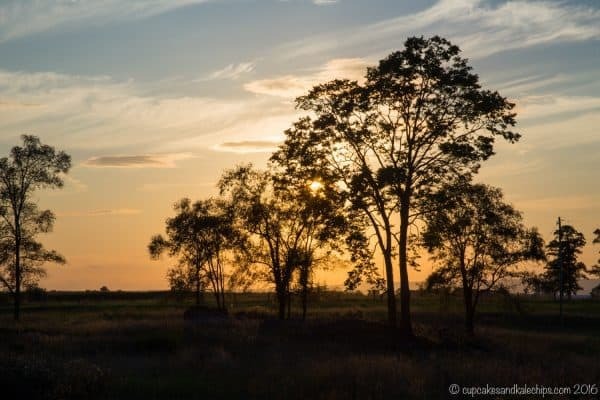 In fact, now that I know that it’s only just over a half hour from my house, I know I need to bring the family because my hubby will love it as much as I do. I know I’ve only lived in Maryland for a couple years, but I can’t believe I never knew I was only a half hour from historic Harper’s Ferry. The rain and some parking issues may have hampered our plans to walk around the town, but now that I know I am so near this quaint town surrounded by amazing places to hike, I know I’ll be back. And Charles Town is just a skip and a hop further. I’m already trying to plan when The Hubby and I can spend a weekend back at Hillbrook, and I know that there are some future family outings to this area of West Virginia and Maryland, which means I hope to keep adding to this list. But in the meantime, there’s plenty of fun a deliciousness for all of us to enjoy, whether gluten free or not. I hope you’ll find out for yourself. Tell them Brianne from Cupcakes & Kale Chips sent you! Such a great write-up of our stay at the Hillbrook and of the retreat! 🙂 Can we go back like now?? I am so glad that you could join us for Sip Dine Shine 2016, Brianne. And yes! You have to get to the Harpers Ferry area more often now that you know how close you are to it. I am so jealous that you only live 30 minutes away!